I hope everyone is having a wonderful weekend. We have had a super rainy day, with even heavy rains predicted for tomorrow. It's been a great day to finish up a few projects. Mostly, I have taken care of cleaning my very neglected house today. I try to keep a routine through the week of deep cleaning one room each night, but that just didn't happen this past week. So today was catch up. There were so many great projects last week. Thank you so much for sharing your amazing talent. Please grab the featured button. A Pile of Scrap created these adorable plates. 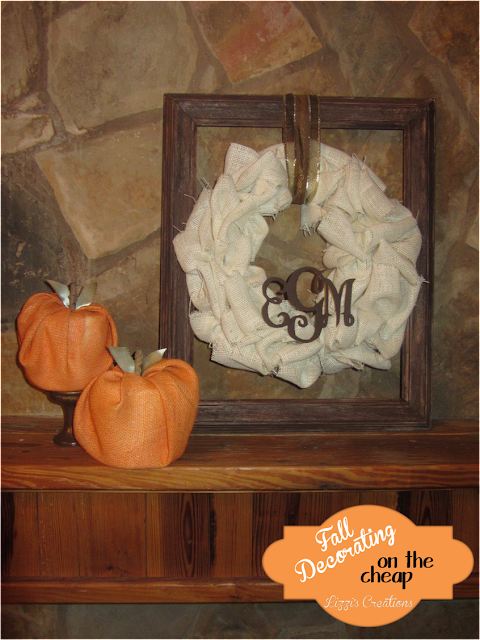 Lizzi's Creations shared her great burlap wreath and adorable pumpkins. One More Time shared a great tutorial for making these fabulous palm leaf pumpkins! The Messy Roost shared her very creative, but oh so elegant pumpkins. 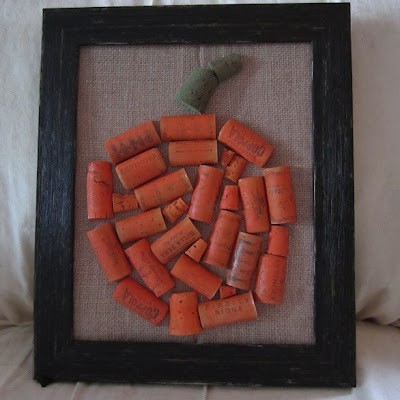 Sarah SaturDIY created this adorable pumpkin using wine corks. At Home with Sweet T made this awesome personalized picture. Such a great gift idea! Tiaras and Bowties shared her adorable Halloween Countdown Blocks. House on the Way has a beautifully decorated fall porch. 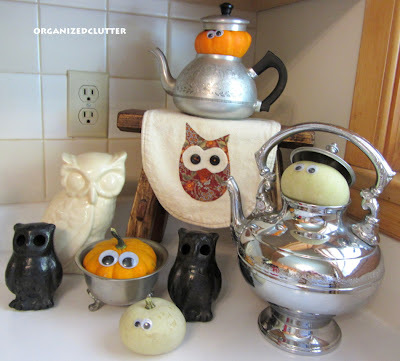 Organized Clutter Queen shared her adorable owl collection. Thanks Kathy for your feature! Thank you for hosting! I'm finding inspiration here! Kathy, these are great features! Thanks so much for hosting! Thanks for hosting a great party...lots of great features and link ups this week! Thank you so much again for hosting, Kathy! I am your newest follower! Can't wait to look around! Thank-you for hosting a lovely linky! 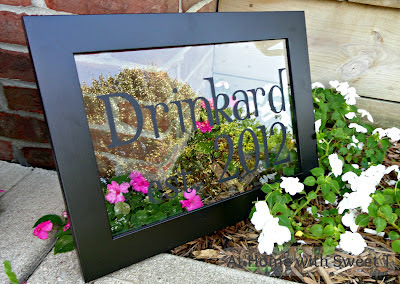 Thank you so much for featuring my outdoor tablescape! All they other features are great. Thank you for hosting! 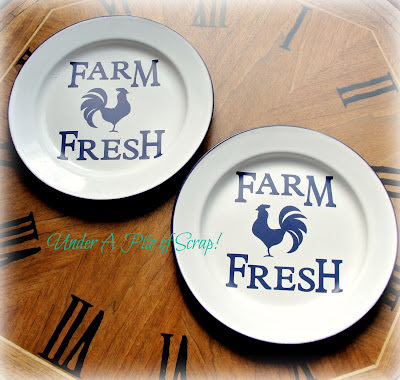 Thank you so much for featuring my Rooster Plates this week Kathy! What a great surprise! Thanks so much for hosting Kathy! I always find some great inspiration here. Your are so welcome, and thank you so much for sharing. So happy to have you! Your are so welcome! Thank you for sharing. So happy to have you! You are so welcome! Thank you for sharing again this week. So happy to have you! You are so welcome!! I've meant to send you an email. I can't seem to get caught up. I love your great pumpkins. Thank you for your sweet comment on my blog Kathy! You're a treasure :)...and yes, it was hard giving him up :(. Hope you got my message about the link on FB? Anywho...it's there now. Thanks for hosting! Hi Kathy, Me again. I got a notification (I have a plug in for this) that told me your link was broken. I tried to fix it four times to no avail. :( I may be talking to my tech guy tomorrow and I will see if it's a problem at my end, but I don't think so. Just wanted you to be aware. Thank you so much for letting me know. Please let me know what you find out. I will check also. Thanks sweet friend!! Your so welcome! I just got your FB message. Just now catching up. :) Thanks so much for letting me know. Thank you so much for hosting. This will be my last link up for while as I am going on maternity leave. Thanks for allowing me to share with your viewers! Thank you so much for featuring my project! Nothing to link this week, but I'll be back next week. Thanks for hosting! Hi Kathy, great features this week - those owls are so cute.